Twelfth-century, French fragment containing the end of the text for the Sunday XV after Pentecost followed by the beginning of the introit for Sunday XVI after Pentecost along with fragments of additional texts for Sunday XVI. On the verso are more fragments of texts for Sunday XVI along with the end of the introit for Sunday XVII after Pentecost, a collect and epistle reading and an incipit for the gradual. Uncertain provenance. Probably produced in France in the last quarter of the twelfth century. Possibly loaned to the WMU library school through Jean Lowrie from the Gethsemani Abbey Library of Kentucky in 1974. Now permanently held by Special Collections, Waldo Library. Numerous random inscriptions and scribbles in various late medieval or early modern hands on recto and verso. Excised from a manuscript at an unknown date; now housed in a modern, protective archival mat frame. Single-line, red-pen versals passim; 3-line red initial "M". 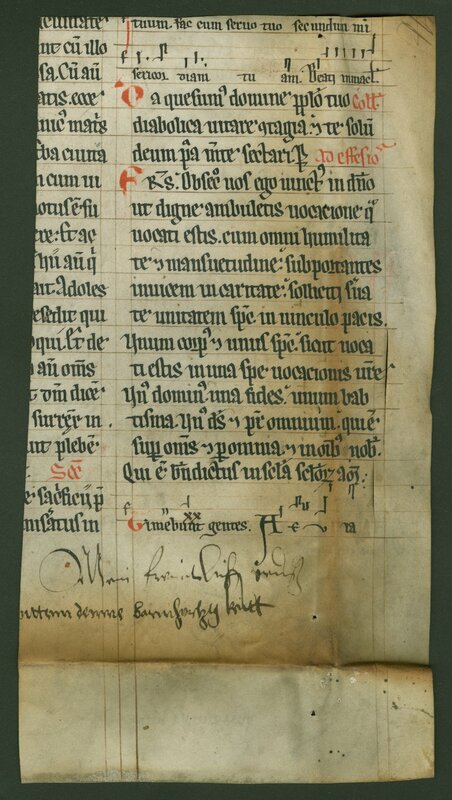 Inscriptions and scribbles in late medieval and early modern hands.